In order to reduce carbon dioxide emissions from fossil-fuel-based power plants, CO2 can be captured and further processed to obtain fuels that readily integrate into the current transportation infrastructure. 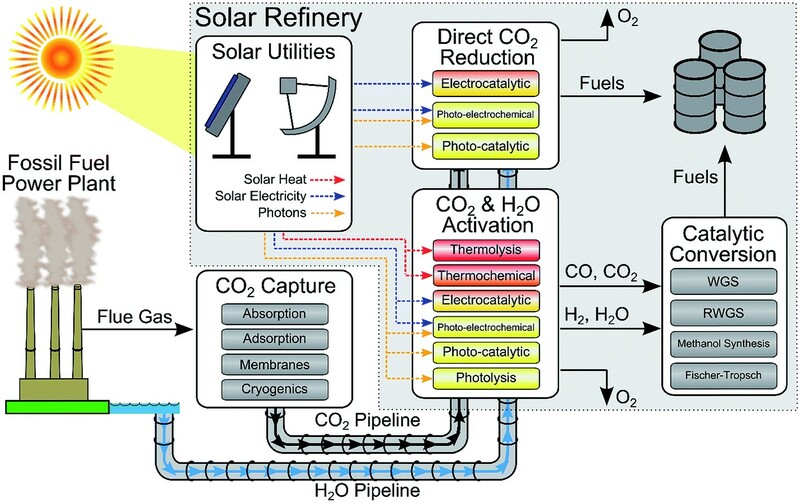 This upgrading of CO2 can be accomplished in a solar refinery, which uses sunlight as a renewable energy source to drive catalytic reactions as shown in Figure 1 (Herron et al., 2015). The two main methods for CO2 conversion include: (1) catalytic conversion using solar-derived hydrogen, and (2) direct reduction of CO2 using H2O and solar energy. Solar utilities can be utilized in the form of heat (e.g., in thermolysis and thermochemistry), electricity (e.g., in electrocatalysis), and as a photon source (e.g., in photo-chemical reactions). We perform systems-level, techno-economic and conceptual design and operational analyses of different process configurations for the solar refinery. In particular, we assess the energetic and economic feasibility of the process by quantifying the impact of key areas, such as solar energy capture and conversion, CO2 capture, catalytic conversion processes, and chemical storage (Kim et al., 2011; Kim et al., 2012; Herron & Maravelias, 2016). Figure 1. Schematic for solar fuels production. The approximate temperature requirements for the solar-driven conversion processes are color-coded (red = high temperature, yellow = ambient temperature). Kim, J., Henao, C. A., Johnson, T. A., Dedrick, D. E., Miller, J. E., Stechel, E. B., & Maravelias, C. T. (2011). Methanol Production from CO2 Using Solar-Thermal Energy: Process Development and Techno-Economic Analysis. Energy & Environmental Science, 4(9), 3122–3132. Kim, J., Johnson, T. A., Miller, J. E., Stechel, E. B., & Maravelias, C. T. (2012). Fuel Production from CO2 Using Solar-Thermal Energy: System Level Analysis. Energy & Environmental Science, 5(9), 8417–8429. Herron, J. A., Kim, J., Upadhye, A. A., Huber, G. W., & Maravelias, C. T. (2015). A General Framework for the Assessment of Solar Fuel Technologies. Energy & Environmental Science, 8(1), 126–157. Herron, J. A., & Maravelias, C. T. (2016). A General Framework for the Assessment of Solar Fuel Technologies. Energy Technology, 4(11), 1369–1391.